Workers at Jaguar's Design Engineering Centre in Coventry got a shock visit from a lethal stowaway that arrived in a delivery to the plant. One of the world's most dangerous spiders, a black widow, was discovered in a shipment of tyres and wheels from Florida last Friday morning. The female spider was spotted by employees John Grady and Ron Seal who recognised the spider from previous trips to Florida and managed to capture it in a plastic container. 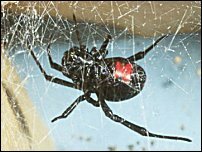 "On trips to our Florida Testing Centre visitors are warned on arrival about the presence of black widow spiders, and their distinguishing feature is a red hour-glass on the underside. As soon as I saw that feature on the spider I knew there was a potential spider and so immediately cleared the area of people and called the plant protection officer." "John and Ron acted very responsibly by clearing everyone out of the room. They were brave to capture the spider and confirm using the internet what breed it was. The first thing we did was contact the RSPCA and Rentokil, and the area was kept secure until Rentokil confirmed that no more spiders could have come over in the consignment." "The black widow spider is found in the United States and its bite could lead to a potentially fatal situation. They look like normal spiders and are often smaller than our large house spiders so the workers acted very sensibly indeed by securing the area and calling the RSPCA." An RSPCA officer took the spider to the Stratford upon Avon Butterfly Farm where she will be cared for by a specialist handler. The farm already has one female black widow spider in its care. Black widow spiders are found in every state in the USA except Alaska and Hawaii. The bite of the female is fifteen times more venomous than that of the prairie rattlesnake. The body of the female is about 1.5in long. Males are about half the size of the female and are harmless, as are the juveniles of both sexes.